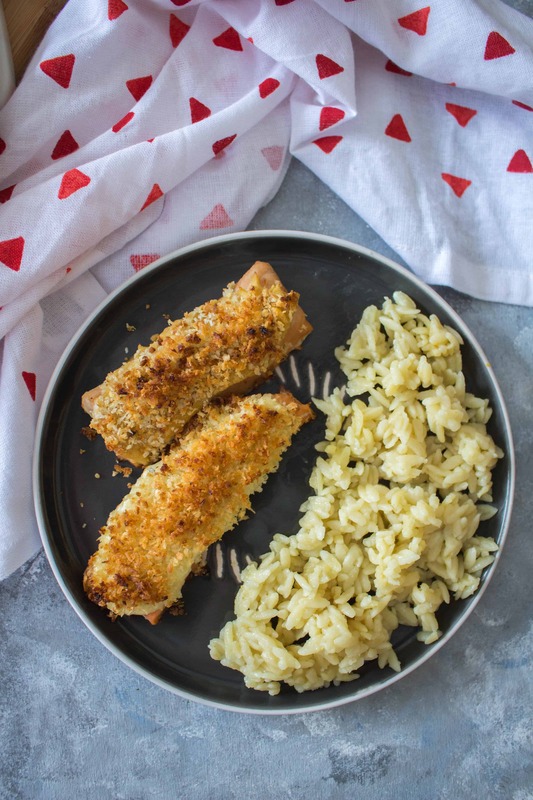 This delicious Hummus Crusted Salmon with Panko is baked to perfection! 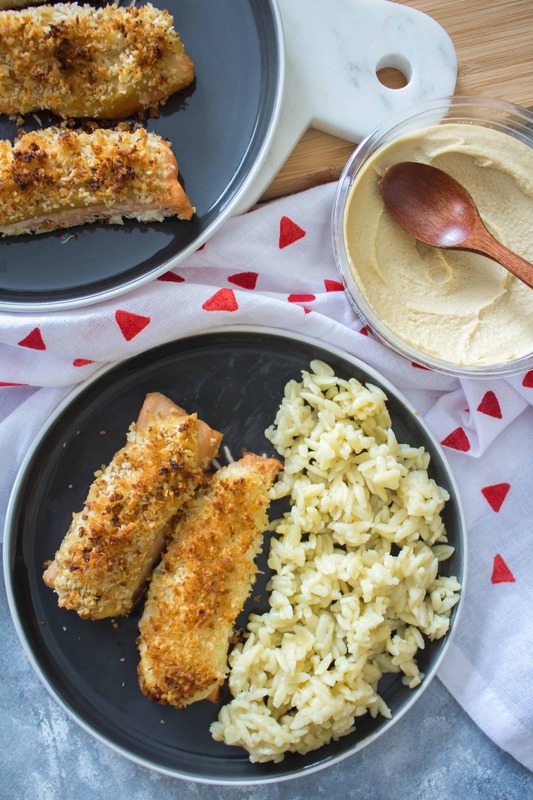 This Hummus Crusted Salmon is perfect for a healthy weeknight dinner and lunch meal prep with the leftovers. Let’s talk salmon. I am so picky when it comes to fish that for the longest time, I wouldn’t eat salmon unless I knew exactly how it was made and who made it. A lot of times in the past it’s been too fishy for my liking. However, salmon is a great source of omega 3-fatty acid, protein, b vitamin, and potassium so I try to make sure I fit it into my diet. Recently, I’ve been on a bit of a baking salmon kick. It’s just so simple and easy to make and it takes just a few seconds to pop into the oven and have dinner ready after work. 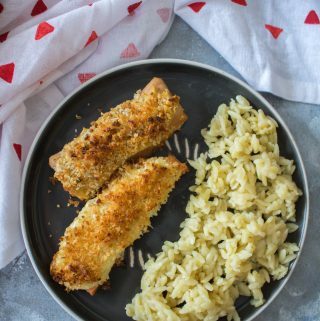 This entire hummus crusted salmon recipe takes less than 30 minutes to make and is crispy but still healthy (and the side I served it with – lemony orzo is cooked on the stove top while the salmon is baking). 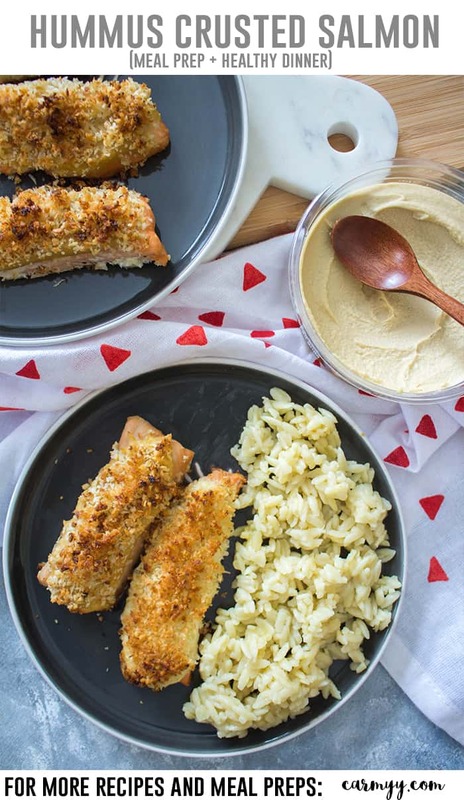 This hummus crusted salmon is literally just salmon and then coat of hummus on top and then a panko mix! It’s super simple. This picture shows 1 lb of salmon but I only use half a pound for this recipe. 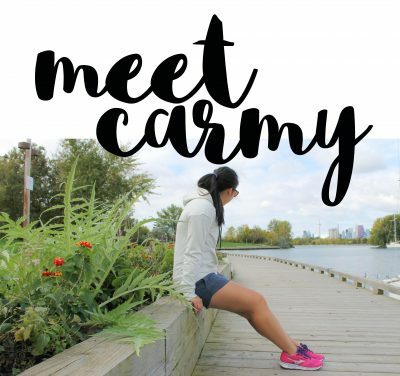 Stay tuned to see how I use the second half to keep things fresh! You know that fishy smell in the microwave? Well, that’s what happens when you microwave fish! Whatever I don’t finish for dinner, I pack in my little bento box and take it to work with me the next day. I eat it cold and if I need to microwave my side (if it’s not a leafy salad), I just microwave it separately! Sometimes I break up the cold salmon into pieces to mix in with my salad or I’ll just have it whole. After portioning the pound of salmon in half, I cut each of the 2 pieces in half. I find that get full after eating one, maybe one and a half of the cut up pieces and can’t finish their pre-portion sized. But I’ll be marking this as 2 servings instead of 4 as 2.5 seems confusing! 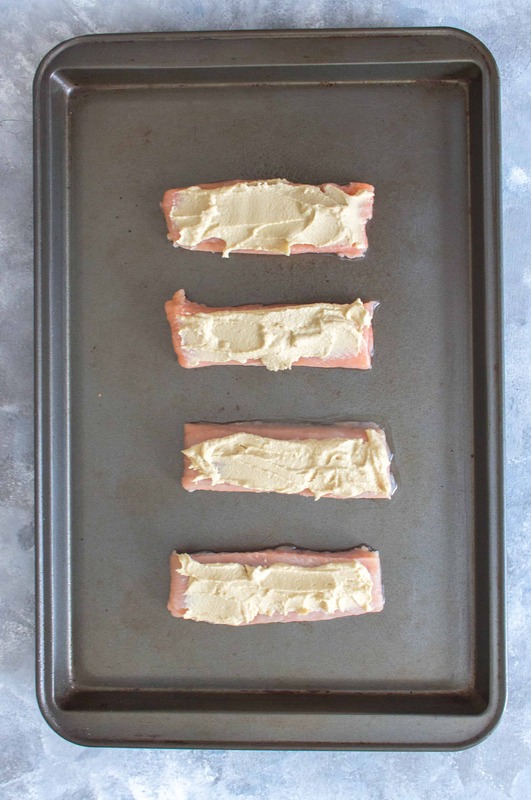 Slice up the salmon and place them on a baking pan (coated with non-sticking spray) and spread a thin layer of hummus on each fillet. 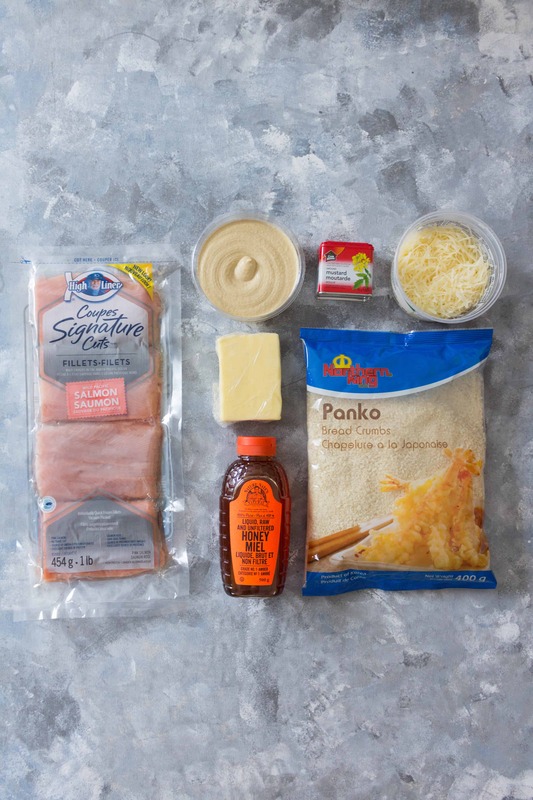 In a small bowl, combine the panko, parmesan cheese, butter, mustard, and honey. 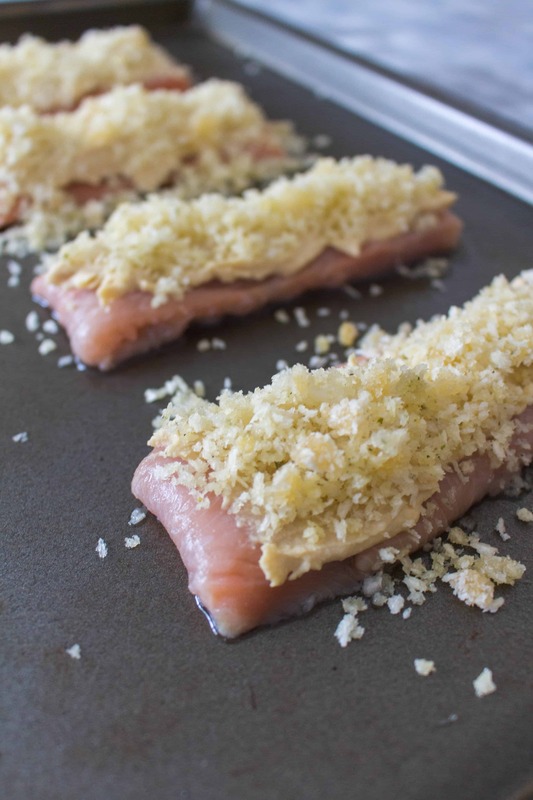 Evenly spoon the panko mix onto the hummus on top of the salmon fillet. Bake for 17 minutes and either serve immediately or eat cold the next day for lunch. Optional: while the salmon is baking, you can either prep some carb or salad to go with it. I made orzo, 1:2 orzo:water with some lemon juice. Let’s chat! What is your go-to fast and easy dinner?